After spending almost three months looking, listening, adjusting angles, and deleting over 10,000 push notifications and emails, we've decided that the Netgear Arlo Pro is the best DIY outdoor Wi-Fi home security camera you can get. Like the other eight units we tested, the Arlo Pro lets you keep an eye on your property and provides smartphone alerts whenever there's motion. However, it's one of the few options with built-in rechargeable batteries to make it completely wireless, so it's easy to place and move. It also delivers an excellent image, clear two-way audio, practical smart-home integration, and seven days of free cloud storage. A Wi-Fi surveillance camera on your front porch, over your garage, or attached to your back deck can provide a peek at what really goes bump in the night, whether that's someone stealing packages off your steps or raccoons going through garbage cans. It can alert you to dangers and can create a record of events. It should also help you to identify someone—and if it's a welcome or unwelcome guest—or just let you monitor pets or kids when you're not out there with them. During initial research, we compiled a huge list of outdoor security cameras recommended by professional review sites like PCMag, Safewise, and Safety.com, as well as those available on popular online retailers. We then narrowed this list by considering only Wi-Fi–enabled cameras that will alert your smartphone or tablet whenever motion is detected. We also clipped out all devices that required a networked video recorder (NVR) to capture video, focusing only on products that could stand alone. Once we had a list of about 27 cameras, we went through Amazon and Google to see what kind of feedback was available. We ultimately decided on a test group based on price, features, and availability. We mounted our test group to a board outside of our New England house, pointed them at the same spot, and exposed them all to the same lighting conditions and weather. 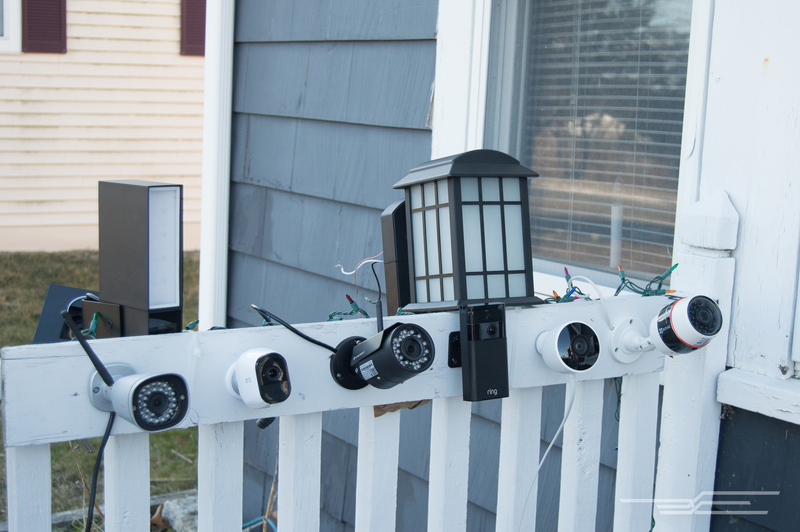 The two exceptions were cameras integrated into outdoor lighting fixtures, both of which were installed on the porch by my husband, a licensed electrician. All nine cameras were connected to the same Verizon FiOS network via a Wi-Fi router indoors. Besides good Wi-Fi, you may also need a nearby outlet. Only three of the cameras we tested offered the option to use battery power. Most others required an AC connection, which means you won't be able to place them just anywhere. We downloaded each camera's app to an iPhone 5, an iPad, and a Samsung Galaxy S6. The cameras spent weeks guarding our front door, alerting us to friends, family members, packages, and the milkman. Once we got a good enough look at those friendly faces, we tilted the entire collection outward to see what sort of results we got facing the house across the street, which is approximately 50 feet away. To learn more about how we picked and tested, please see our full guide. 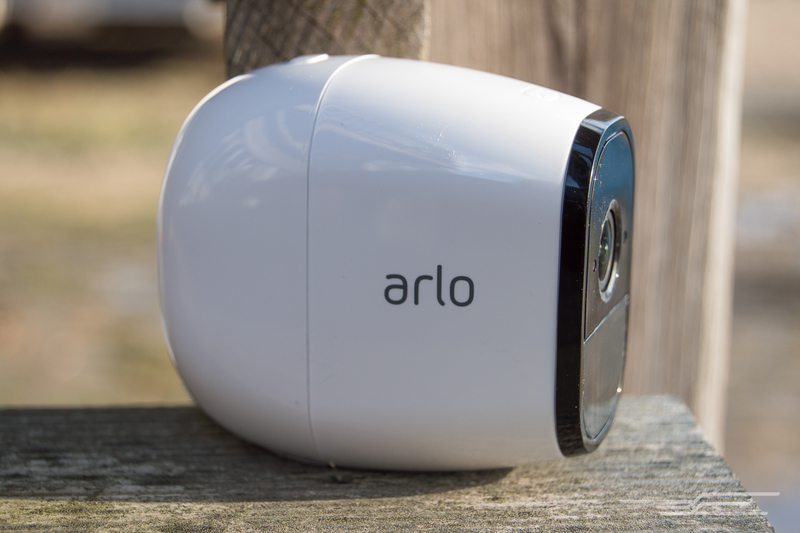 The Arlo Pro is a reliable outdoor Wi-Fi camera that's compact and completely wireless, thanks to a removable, rechargeable battery that, based on our testing, should provide at least a couple of months of operation on a charge. It's also the only device on our list that offers seven days of free cloud storage, and packs in motion- and audio-triggered recordings for whenever you get around to reviewing them. With a 130-degree viewing angle and 720p resolution, the Arlo Pro provided clear video footage during both day and night, and the two-way audio was easy to understand on both ends. The system also features the ability to set rules, which can trigger alerts for motion and audio. You can adjust the level of sensitivity so that you don't get an alert or record a video clip every time a car drives by. You can also set up alerts based on a schedule or geofencing using your mobile device, but you can't define custom zones for monitoring. All of those controls are easy to find in the Arlo app, which is available for iOS and Android devices. If you're looking to add the Arlo Pro to a smart-home system, the camera currently works with Stringify, Wink, and IFTTT ("If This Then That"). SmartThings certification was approved and will be included in a future app update. The Arlo Pro is also compatible with ADT Canopy for a fee. 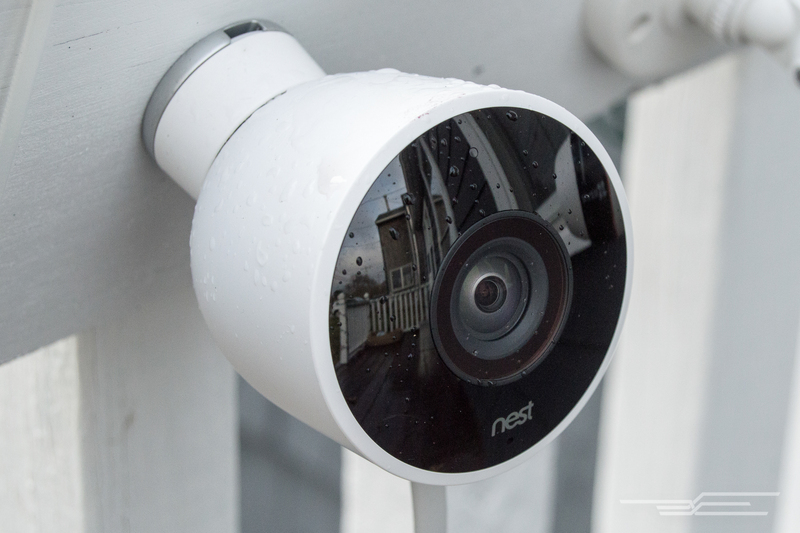 The Nest Cam Outdoor is a strong runner-up. It records continuous 1080p video, captures to the cloud 24/7, and can actually distinguish between people and other types of motion. Like the Nest thermostat, the Outdoor Cam is part of the Works With Nest program, which means it can integrate with hundreds of smart-home products. It's also the only model we tested that has a truly weatherproof cord. However, that cord and the ongoing subscription cost, which runs $100 to $300 per year for the Nest Aware service, is what kept the Nest Cam Outdoor from taking the top spot. Like our top pick, the Nest Cam Outdoor doesn't have an integrated mount. Instead, the separate mount is magnetic, so you can attach and position the camera easily. Although it has a lot of flexibility in movement, it needs to be placed within reach of an outlet, which can be a problem outside the house. That said, the power cord is quite lengthy. The camera has a 10-foot USB cable attached, but you can get another 15 feet from the included adapter/power cable. The Nest Cam Outdoor's 1080p images and sound were extremely impressive, both during the day and at night. In fact, this camera delivered some of the clearest, most detailed images during our testing, with a wide 130-degree field of view and an 8x digital zoom. The Nest app is easy to use and can integrate with other Nest products, such as indoor and outdoor cameras, the Nest thermostat, and the Nest Protect Smoke + CO detector. You can set the camera to turn on and off at set times of day, go into away mode based on your mobile device's location, and more.